The new rocket-powered robotic arm, shown in this diagram, is stronger and faster than the ones on the market. 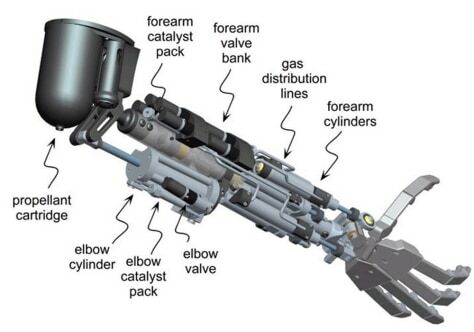 Here's how it works: The propellant cartridge contains pressurized liquid hydrogen peroxide, which is routed through two flexible lines (not shown) across the elbow joint and into two catalyst packs. The catalyst burns the hydrogen peroxide, generating steam that pushes pistons up and down — allowing the arm to move.